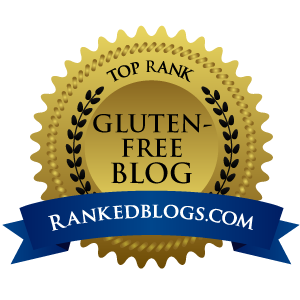 … Dressed in a Pecan Streusel Topping! 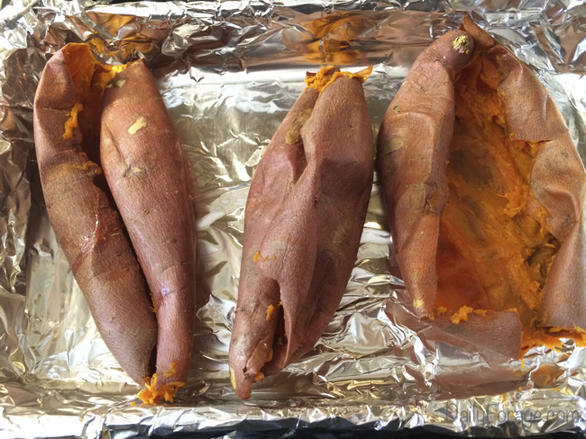 I could go on and on about how good sweet potatoes and yams are for your health. I could share with you the many ways there are to prepare these brightly colored tubers of the earth. But I won’t. Why? Because this recipe turns sweet potatoes, the dark red garnet ones are my preference, into an oven-prepared side dish treat needing no explanation or bribing to be eaten. They are scrumptious, with their baked flesh that becomes tender and sweet, much more so than when boiled or sautéed. When smashed or gently whipped, it simply melts in your mouth. 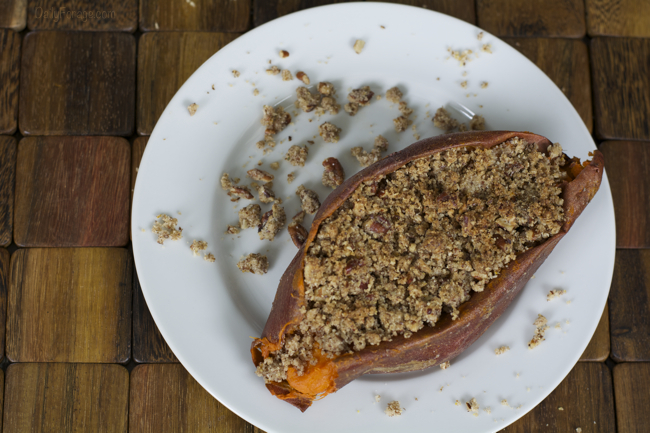 And if that isn’t enough … the pecan topping, with its bit of nutty crunch, and brown sugar/”butter” crumble oozes sweetness into the root vegetable meat while turning golden and crispy at the cap. The scent of fresh, warm orange zest hits your senses just as you bite into a forkful of goodness. It’s a perfect balance of flavors. That’s what this recipe is all about! Mmmm … so good! Preheat oven to 375ºF. 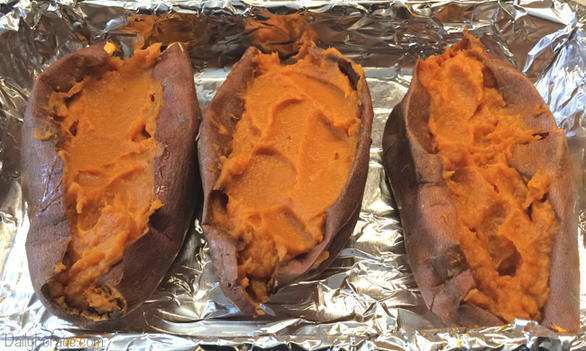 Bake potatoes in a foil-lined baking dish on center oven rack for 60-70 minutes, until fork-tender. 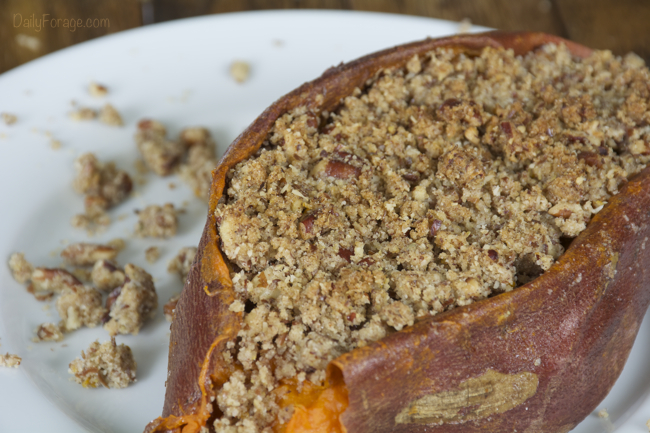 While potatoes are baking, combine all Pecan Streusel Topping ingredients EXCEPT for the 1 Tablespoon “butter”. Using fingers or a fork or pastry cutter, mix ingredients into a crumbly mixture. Cover and place in the fridge until ready to use. When potatoes are fully cooked, remove from oven. Cut potatoes lengthwise (from tip to tip), cutting all the way through the potato if serving half-potato portions per person, or cut only through the top skin from tip to tip if serving whole-potato portions. Scrape out the soft potato flesh and place in a bowl. With an electric mixer, mash potato with syrup, zest and salt until creamy and smooth. 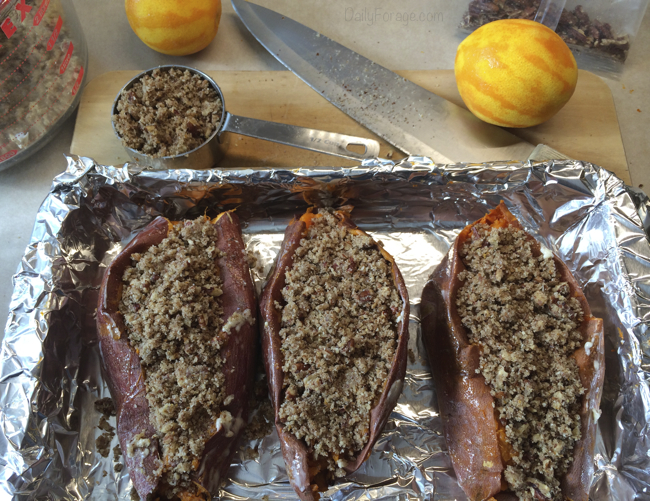 Fill potato skins evenly with mashed sweet potato mixture. Smooth tops. Top each potato with 1/4 -1/2 cup streusel topping. Lightly rub the outside and top edges of the potato skins with the remaining 1 Tablespoon of “butter”. Bake at 375ºF for 20-30 minutes or until topping gets a bit crunchy and golden brown. Serve immediately, or allow potatoes to cool completely to room temperature on a cooling rack, then wrap individually in plastic wrap and keep chilled in for up to two days, or freeze for longer storage.